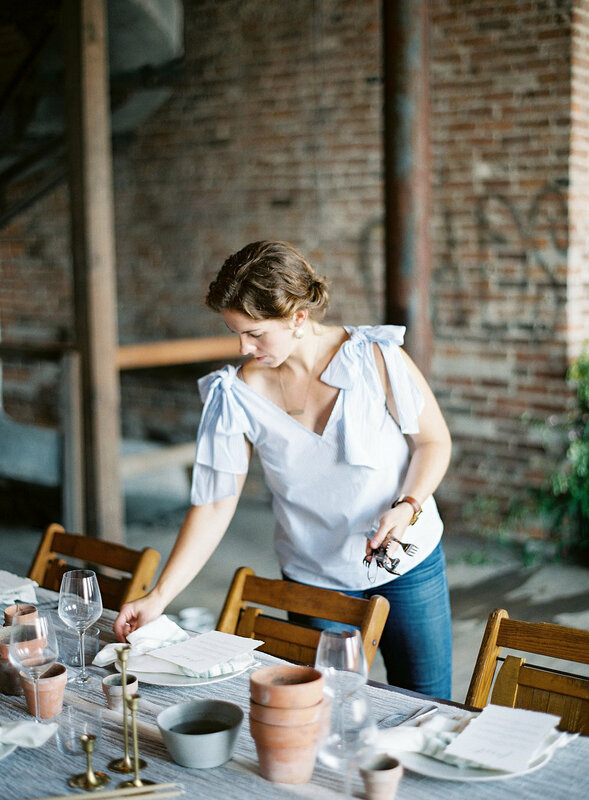 Words from Samantha Joy Events “As soon as stepped into the old paper factory I fell in love with the brick arches, and high ceilings. I wanted to breath new life into it. You could feel the history and the story that was waiting to be told again. Inspired by the brick I thought of a potter's bench, the look of the overgrown greens, piled high terracotta pots among the perfectly groomed garden. I wanted to interpret it as a nice dinner with friends. I wanted to collaborate with Mari of Something Old Dayton to style 2 separate dinner table concepts. We ended up create two garden inspired concepts. The long hairpin leg table from Something Old Dayton was dressed with a ivory cheese cloth, while each place setting was set with a striped linen napkin and the menu for the evening. In true family style dining style their were several wine bottle and charcuterie spreads for guest to share as they arrived. The table was adorned with free form arrangements from Evergreen Floral Co and accompanied by potted herbs in antique terracotta pots to give it that garden feel. Tall skinny candles from Creative Candles and modern dinnerware helped the table feel clean and elegant. The smell of the herbs sure didn’t hurt and guests could pick straight from them to add to their dish. Floral Design: Evergreen Floral Co.